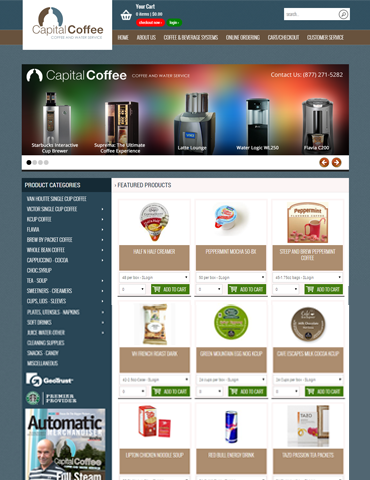 OCS Access offers, a robust, yet affordable, e-Commerce solution specifically designed and developed for the Office Coffee Service community. Our state-of-the-art online ordering system provides a pleasant and efficient buying experience for customers thus helping OCS operators to retain and strengthen relationships. At the same time, OCS operators can enjoy the cost savings and efficiencies of an online ordering system, which allows them to compete more effectively in the industry. OCS Access provides web-based e-commerce software to OCS businesses serious about online sales. OCS Access is an solution provider & application developer, meaning that the software developed by OCS Access is also hosted, managed, and maintained by us. The OCS Access solution is designed to interface with numerous backend systems which allow the orders to be written directly into your system. For companies who do not have backend business systems, orders can simply be routed to an email address you specify. To see why OCS Access can benefit your company, read below! OCS Access is constantly expanding its features and capabilities. We are an industry-specific solution focused on OCS, Vending, Bottled Water, and Food Service Companies. This means we are focused in the areas that are important to you and your customers. We have a unique knowledge of the industry, which allows us to assist you in planning & using your site most effectively. An understanding of the market you serve & the typical operating flow of companies like yours is critical to the development of a successful solution. Because we service only your industry, our solution is highly customized to contain features specific to the needs of OCS, Vending, Bottled Water, and Food Service Companies not found in other 'canned' solutions (i.e. Bottle Deposits, Pre-Calls, Route Schedules, Open Account Billing, etc). Everything about our system, from the way products are displayed, to customer specific pricing, to the way customer accounts are handled was written specifically for the way OCS operators/Bottled Water companies work. What Are The Additional Benefits of OCS Access? OCS Access is a monthly subscription based service, just like AOL and many other Internet based services. You are not locked into a long term contract and you can cancel your subscription at any time. Enhance the customer experience while lowering the cost of doing business. Eliminates errors made during the re-keying of faxed orders. Customers enter their own orders allowing customer service reps to focus on other tasks. Accept orders 24x7 even when you are closed and no-one is there. Increase brand awareness. More info = more selling opportunities & the potential for deeper penetration into existing accounts. Set yourself apart from your competitors. Use your website as a customer retention tool. The value of an existing long term customer is many times greater than that of acquiring short term business. Decreased time to market! The ability to seize opportunities for competitive advantage increases as the amount of time required to announce changes to your product & service offerings is reduced. Customer service becomes self service. Present a one-to-one business service environment to your customers at a fraction of the cost of additional customer service personnel. The mobile web is no longer a concept - it's a mainstream reality that will impact any organization that aims to communicate with target audiences online. Mobile phones have already outsold PCs and are becoming the most common Web access device worldwide. The responsibility is now to get a mobile website presence to appeal to the mobile market and generate new business. There are some applications that are better-suited to an app format, and often it makes sense to have both an app and a mobile website. But for a well-rounded mobile presence a mobile-optimized website is generally a practical and effective first step. A mobile website is always available on all smartphones an app requires users to download the app before it can be accessed. If you'd like to learn more about developing a mobile-friendly eCommerce website for your organization, contact us for a free consultation. We'll be happy to learn more about your needs and offer recommendations. 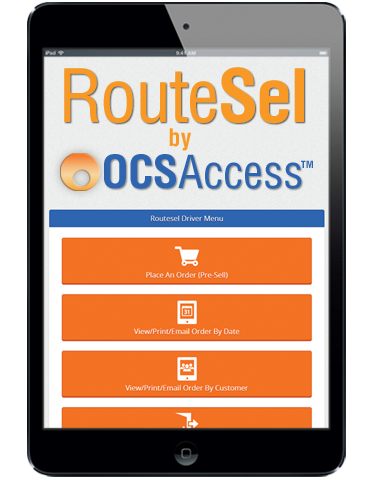 The OCS Access RouteSel web-based tablet solution, allows drivers and sales representatives to write additional orders for customers, on the spot, at their location. The need for mobile printers with traditional handheld solutions is eliminted because the orders are optionally emailed to the customer instantly. Additionally, no more end-of-day syncing is required - everything happens in real time with the OCS Access RouteSel tablet software. RouteSel also features optional signature capture with instant transmitting of the signatures back to your office. Orders arrive at your office before the driver or sales representative leaves the customer! Whether you are a small business looking to generate some "buzz", or a larger business looking for a better converting website, we are here to help. Our expertise extends into all markets touched by the OCS industry reaching far beyond the traditional website design company. We are dedicated to every client's individual needs offering the utmost attention to detail. Every web site designed by OCS Access is a direct representation of us and our company's standards. OCS Access does not use templates; we build every website from your ideas. 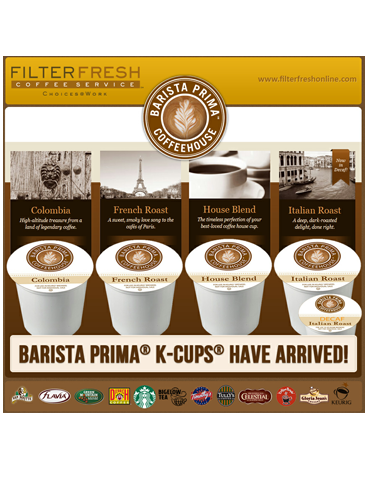 We understand industry-specific design elements; we know about all lines of brewing equipment, healthy vending initiatives, micro-markets, bottle-less water filtration systems, and more! Whether you are a new company looking for an image or an established business needing a face lift, we have the solution. We'll do much more than design a "good" website for your company. We'll design and develop an interactive web site that gives your company instant credibility in the OCS market, enhances your corporate image, and motivates your visitors to act! 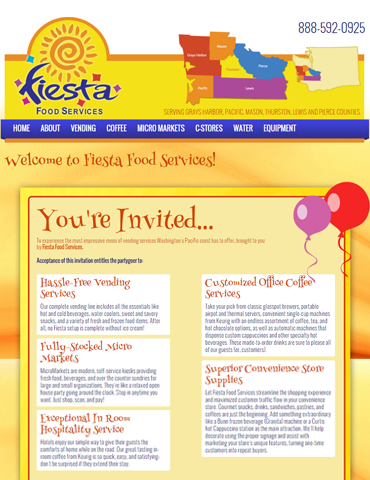 View some of our recent projects on our web design portfolio. If you'd like to learn more about developing a website for your organization, contact us for a free consultation. We'll be happy to learn more about your needs and offer recommendations. Need to keeps customers coming back to your website? OCS Access can help you to maintain a direct relationship with your clients at a fraction of the cost of traditional media. 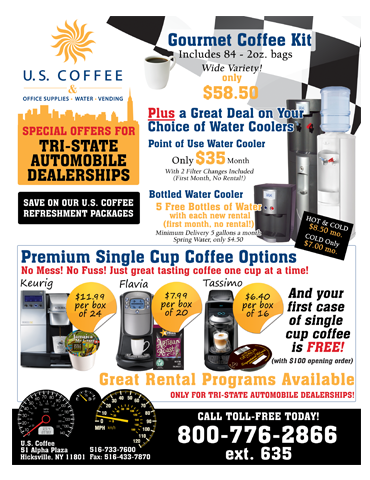 Email newsletters and promotions often receive 10 times the response rate of direct mail. OCS Access can easily manage your email campaigns - No HTML skills required and no IT burden on your company! We guarantee that all of our designs are compatible with most of the top email clients, so you can be confident your campaign will look right to all of its recipients. And others at your request! A well designed newsletter/email template can be the difference between success and failure. Whether it's to update customers about a new coffee brewing option, or to share information, having a well designed template can be a great starting point to guide your customers and give them a clear coherent direction when they read your email. OCS Access provides all clients with professionally designed, custom email designs that comply with your brand's style guidelines, follow best practices for email marketing and look great. Collateral is an important part of any business, but particularly OCS companies. Whether you are handing out a business card or mailing a product catalog, you can be certain that your potential clients are making an assessment - positive or negative - of your business based on the design and professionalism that your piece of collateral conveys. Clients trust a company that looks polished and experienced. OCS Access can help your OCS operation convey that sense of professionalism by designing collateral that delivers results. From flyers and brochures to press kits and business cards, OCS Access can help develop a design that gets your message across while staying within your budget. With over a decade of experience designing printed materials for the OCS Industry, our technical knowledge of print production and industry knowledge of trends, helps save you time and money on all your print projects. Together we will create a marketing image that includes color schemes, type treatments, slogans and image standards. Your marketing identity will easily carry through into all your marketing projects. OCS Access can design the business card, catalog, or other print collateral that will get you the positive attention you deserve and make a great first impression. Our goal is to design collateral that will powerfully and effectively communicate the message you desire while projecting a professional image that is clean, fresh, and polished. If you'd like to learn more about creating print work for your OCS operation, contact us for a free consultation. We'll be happy to learn more about your needs and offer recommendations. If these services could enhance your OCS operation, we'd be glad to help! OCS Access was founded in 2003 by a group of software development professionals who saw a need for specialized software in the office coffee, vending, foodservice, and bottled water industries. OCS Access is a monthly subscription service that does not lock operators into a long-term contract. 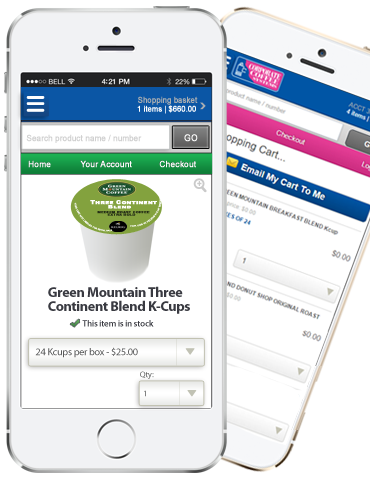 Its Internet ordering solution is fully integrated into existing industry back-end systems used by operators, including ChallengeMaster, Crane Streamware, InOne Technology, MEI and many custom programs. It enables operators to take full advantage of the service's sophisticated "cart" features, and to use their existing management software to update product, customer and pricing information without having to learn new software and repeat the entry of existing information.